The simple facts are enough to exhaust you right off the bat: a 28,000-pound, 23-foot-long boat. Two oars. One woman. A 3,600-mile journey. Fourteen-hour days of nonstop rowing. “A Pearl in the Storm,” Tori Murden McClure’s account of her quest to be the first woman to row solo across the Atlantic Ocean, makes clear that the challenge — even for a woman who could bench-press 650 pounds — was daunting. For three months McClure endured relentless monotony, intense loneliness, punishing physical pain and, most incredibly, a hurricane that pummeled the American Pearl with 30-foot waves, flipping it more than a dozen times, sometimes end to end, beating and battering McClure nearly to death. Thankfully, her voyage also included exquisite beauty: the thrum of whales singing in the deep, dolphins carving watery arcs across her oars and the shimmering phosphorescence of a nighttime sea. 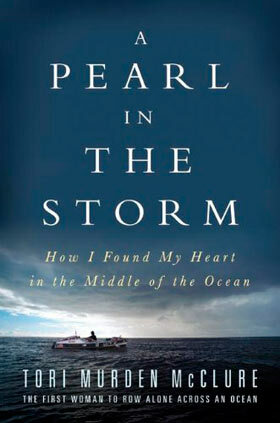 No question about it: “A Pearl in the Storm” is a rip-roaring adventure tale. But woven into its fabric, in alternating chunks of narrative, is another story: the author’s effort to understand her life on land, including the helplessness she felt growing up with a disabled brother who was badly bullied and, in one excruciating episode, assaulted while she watched. McClure’s rage at her inability to protect him became the driving force of her life. She decided to go to law school, she explains, because “I wanted to understand the law for the same reason I wanted to understand a chain saw: competence trumps helplessness.” Yet neither her law degree nor the divinity degree she acquired earlier at Harvard provided the control or peace of mind she craved. It’s impossible not to marvel at the author’s grit and determination as she prepared for a second attempt at the transatlantic record. But despite the built-in drama that powers this book, the writer’s voice can sometimes seem oddly detached and mechanical, her cadence flat, as if driven by the same sheer will and emotional toughness required to survive a solitary row across an ocean. As it turns out, McClure eventually stumbled into love, and with it came, finally, a measure of wisdom and a different take on the demons that have plagued her. “Our helplessness makes us human,” she writes. “Love is what makes our humanity bearable.” McClure’s superhuman feat will live on in the record books. But she seems to have realized that her personal victory — the discovery of happiness and a meaningful life — is equally worth celebrating. Not only does she come back alive, she finds her land legs, too.